The BJP today made light of the Congress's claim that the Opposition had the numbers to back its no-confidence motion against the government. 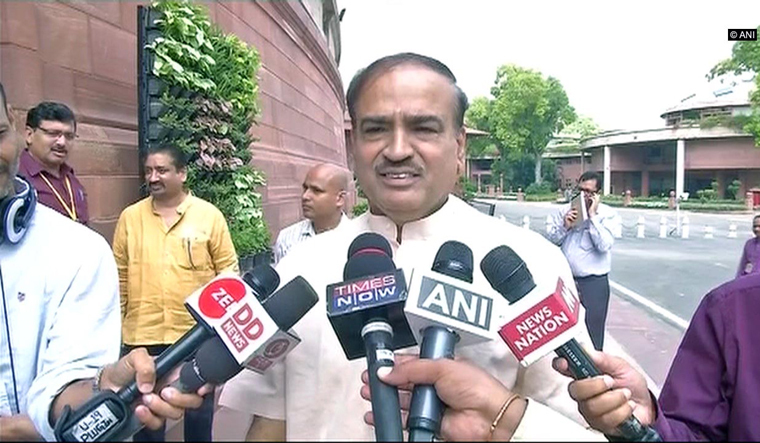 Asked about Congress leader Sonia Gandhi's claim that the Opposition had numbers, Parliamentary Affairs Minister Ananth Kumar took a dig at her, saying, "Sonia Gandhi's maths is weak." Kumar also recalled that Gandhi, as the then Congress chief in 1999, had claimed to have the support of 272 MPs, the majority mark in the Lok Sabha, after the fall of the Atal Bihari Vajpayee-led NDA government. Echoing similar sentiments, BJP general secretary Ram Madhav said the government had the strength in the House to defeat the motion if one went by Indian mathematics and wondered if Sonia Gandhi knew some other mathematics. According to sources in the ruling party, it is confident of getting the support of as many as 314 MPs in the Lok Sabha, when the opposition-backed no-confidence motion is put to vote tomorrow. Going by the estimate of the BJP's floor managers, the government is likely to get the support of smaller parties outside the NDA such as the PMK and the Raju Shetty-led Swabhimani Paksha. Although the two parties are no longer part of the NDA, the government believes they would stand by it during the vote on the motion. BJP sources said the Narendra Modi-led government would get the support of 314 MPs in the Lower House, which has an effective strength of 533 at present. The list of the 314 MPs, however, did not include the name of Lok Sabha Speaker Sumitra Mahajan, who was also a BJP MP, they added. The majority mark in the Lok Sabha currently is 267. In a House of 533 members, the ruling National Democratic Alliance (NDA) has 313 MPs, including 274 (including the speaker) of the BJP, 18 of the Shiv Sena, six of the Lok Janshakti Party (LJP) and four of the Shiromani Akali Dal (SAD). The stated strength of the Opposition in the Lower House is 222, including 63 MPs of the Congress-led UPA, 37 of the AIADMK, 34 of the Trinamool Congress (TMC), 20 of the Biju Janata Dal (BJD), 16 of the Telugu Desam Party (TDP) and 11 of the Telangana Rashtra Samithi (TRS). Mahajan today announced that the House would take up the debate on the no-confidence motion, moved by several opposition parties on issues such as a special category status to Andhra Pradesh, cow vigilantism, mob lynching, atrocities against women and Dalits and the alleged dilution of the SC/ST Act, tomorrow (July 20). The speaker had not accepted the notices for a similar motion during the Budget Session, which was washed out due to a continued uproar by the TDP, TRS and some other opposition parties. The notices were rejected by Mahajan on the ground that the House was not in order as there were continuous protests in the Well by the opposition members on various issues.